A dementia-friendly community is a geographic area, be that a village, town or city, where people living with dementia and their carers feel understood, supported and respected. They feel confident that they can contribute to community life. A dementia-friendly community is a community made up of dementia-friendly individuals, businesses, organisations, services, and faith communities that support the needs of people with dementia. Source – Alzheimer’s Society Code of practice for the recognition of dementia-friendly communities in England. Learn more about dementia, how you could reduce your risk of it, and make a Dementia Commitment to help to build a dementia-friendly New Zealand by taking our short online course. The Dementia Commitment is free, interactive and only takes around 20 minutes. 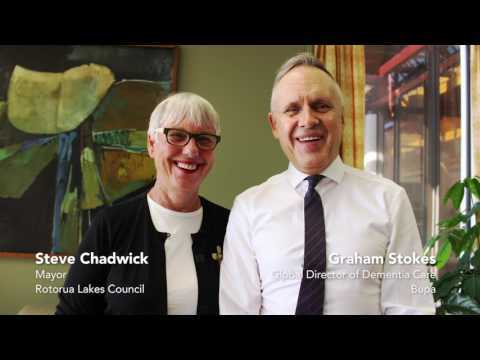 A dementia friendly Retirement Village: Bupa Fergusson was the first in NZ to receive a dementia-friendly award. Raising awareness of dementia through art: Rotorua hosted an interactive, eye-catching light sculpture display that grabbed the publics attention and helped raise awareness of dementia. Could we have a dementia-friendly society by 2030? Looking ahead to 2030, the number of people with dementia around the world is estimated to increase from 46 million today to 75 million. Source: World Alzheimer Report 2015. If we wish to achieve a vision of a society which puts people first, culturally and within communities, living spaces, workplaces, and care environments, then we must start today.